Welcome to the fourth Friday of the month when we introduce a fantastic guest with her really beautiful project. 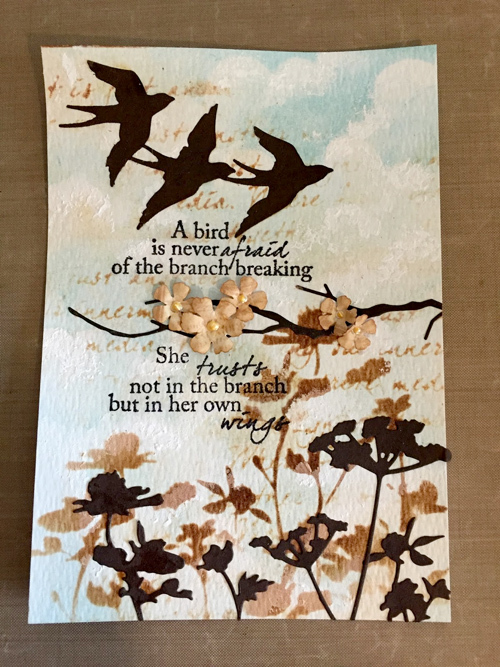 I am sure you are going to love this stencil creation from Susan and it's over to her to tell you about herself and more about her design. Hello Everyone! My name is Susan Mostek. 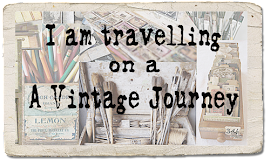 I was so honored to be asked to be A Vintage Journey Creative Guide this month for the Stencil-It theme! I live in beautiful Boulder, Colorado at the foot of the Rocky Mountain with my husband. I have two grown children, now 28 and 26. Crafting has always been a big part of my life since a young age. My mother said it was always hard to keep me in supplies! I discovered paper crafting shortly after moving to Boulder almost 22 years ago and have never looked back. 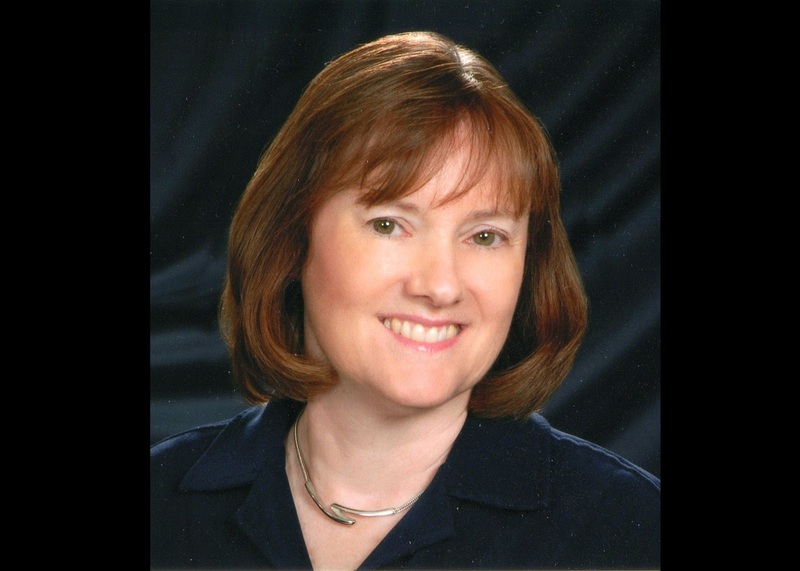 I love to host (Compendium of Curiosities and now Creative Carte Blanche) and participate in art adventures and have been published in multiple magazines over the years. As I am surrounded by incredible beauty here in Colorado, I took my inspiration from Nature for my stenciled piece along with one of my favorite quotes. 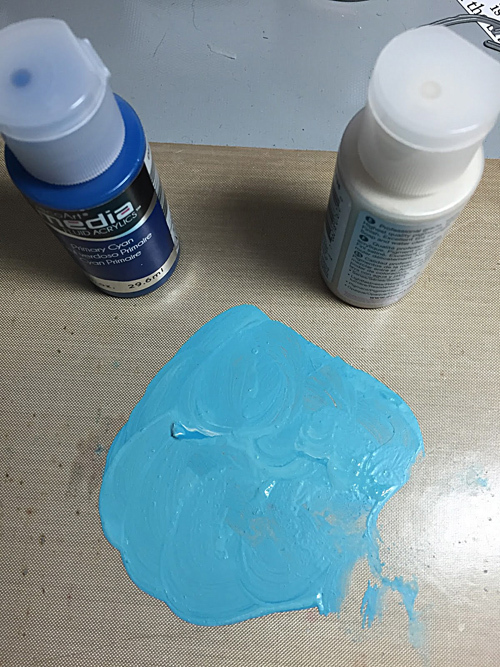 I began by stenciling clouds onto a piece of watercolor paper using an old cloud stencil and DecoArt paints in Primary Cyan and Titanium White mixed together. I started with heavier color at the top, making it lighter as I worked down the paper. 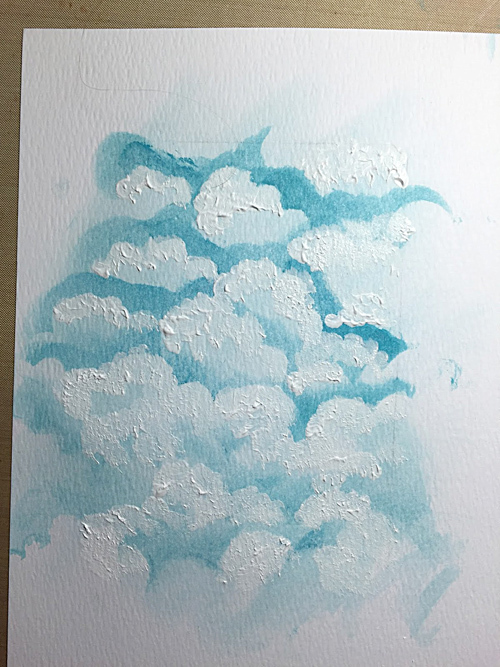 I then went over the light areas with white gesso and a stipple brush to make the clouds look "puffier". Just to show you that you can always change your mind when you do something you don't like, here is the photo of my original clouds. I decided that the blue of the sky was way too bright, so I toned it down quite a bit. 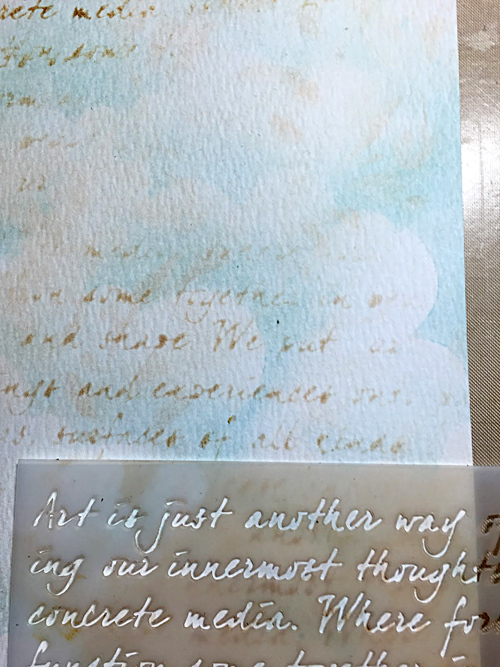 Once dry, I used a stencil called "Art Is" from Crafter's Companion to add some words randomly over the top of the piece using Vintage photo Distress Ink. Then I laid down the pieces I wanted to incorporate into my project for placement and added this lovely quote from B Line Designs. I stamped the quote onto tissue paper using black Archival ink and then split it in half and adhered it with matte medium, leaving room to place a Woodland Branch die cut from memory Box. At this point I stenciled Tim's Wildflowers using Vintage Photo Distress Ink along the bottom and into the center of the paper. I love that there is a coordinating Wildflower die now as I knew the dies would be perfect to place over the top of the stencil. They add so much depth to the piece. 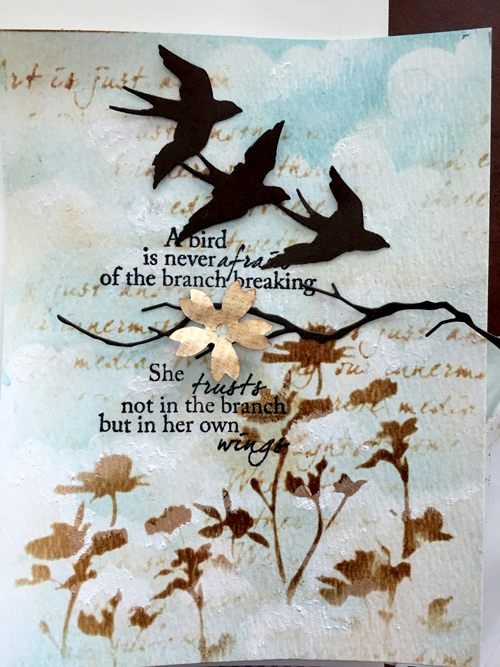 To finish it off, I adhered the branch along with some flowers die cut from patterned paper scraps using Tim Holtz's Sizzix Alterations Tattered Flower Garland die. 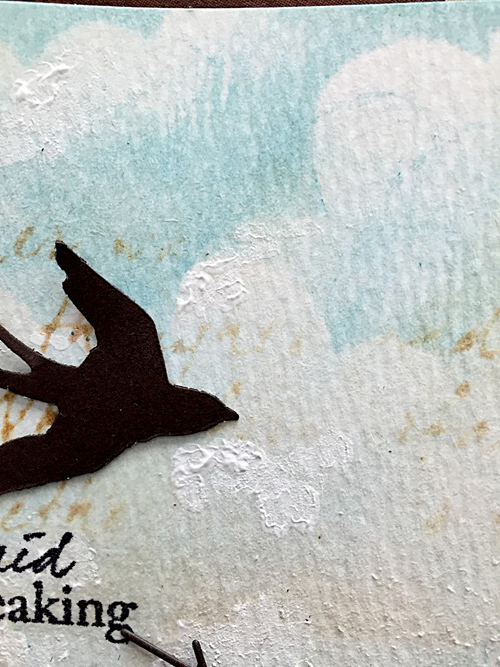 The birds are from Tim's Sizzix Alterations Birds in Flight die cut from dark brown scrap card stock. I Initially thought I would alter a frame for this piece, however, I found a Shabby Chic frame at my local hobby store that I felt was perfect to accent my finished art and wouldn't take away from it. I love it! Thanks again to the lovely ladies at A Vintage Journey. I am loving all the wonderful stencil art I have seen this month! 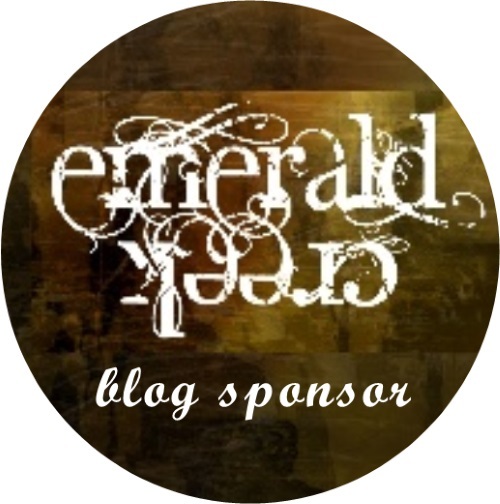 For more information, please visit my blog paperskiesandhazeleyes. I would love to see you there! Thank you so much Susan for being such a fabulous guest and sharing this beautiful frame with us with it's wonderful neutral tones and perfect sentiment. The clouds and the sky look so authentic in the background and those sweet little flowers adding just a pop of dimension is perfect. 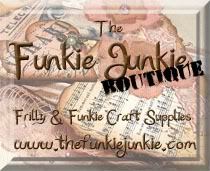 So you have till Wednesday to add your creation to the linky to join the wonderful collection of entries that has been gathering this month. and maybe you will be the winner of the £"0 gift voucher from Country View Crafts. Have a great weekend and thanks for joining us. This is gorgeous! the Art Is, is one of my favourite most used stencils. Gorgeous Susan, love the beautiful background and soft colours. Just beautiful Susan. Your colors are perfect with the frame. Very special sentiment too. Soooo enjoyed your guest design spot. Thanks bunches! Xj. Beautiful Susan! I love how you've built layers to give depth to the scene. Such a stunning piece Susan,- the background looks amazing aalready, then the work with the flower stencil and dies adds lovely depth as you say. 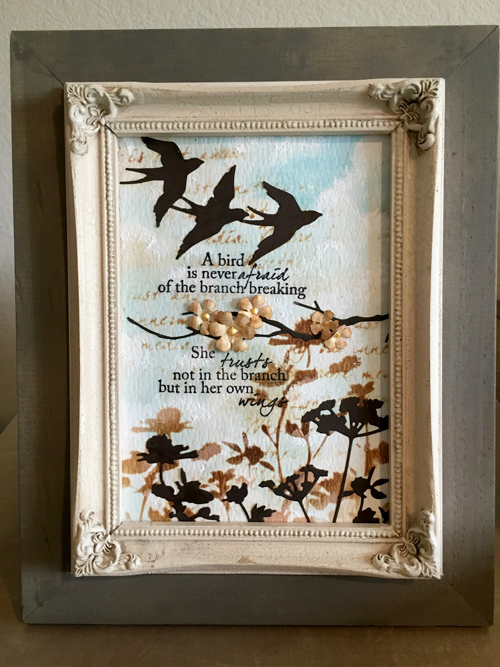 The finishin touches of the branch, flower and birds, finish it all to perfection and I just love that frame! Thank you so much for joining us here at AVJ!